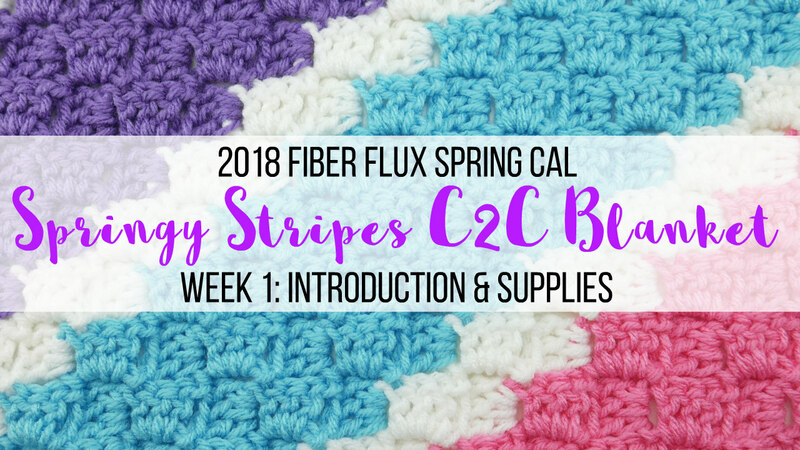 Fiber Flux: 2018 Fiber Flux Spring CAL! Springy Stripes C2C Blanket, Week 1: YARN Giveaway, Intro, and Supplies! 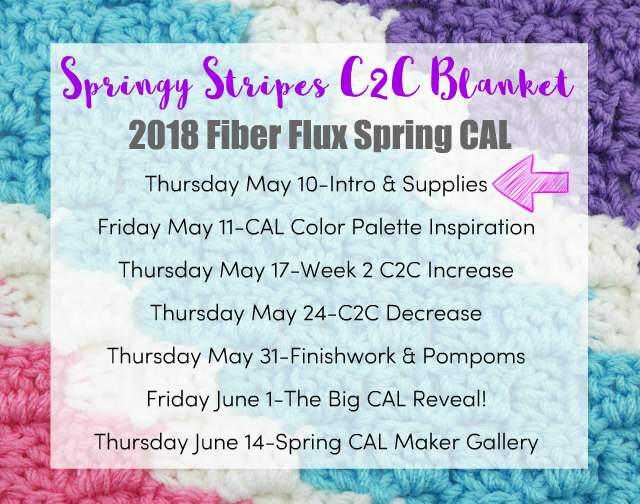 2018 Fiber Flux Spring CAL! Springy Stripes C2C Blanket, Week 1: YARN Giveaway, Intro, and Supplies! Welcome to the 2018 Fiber Flux Spring Crochet Along...yippee! 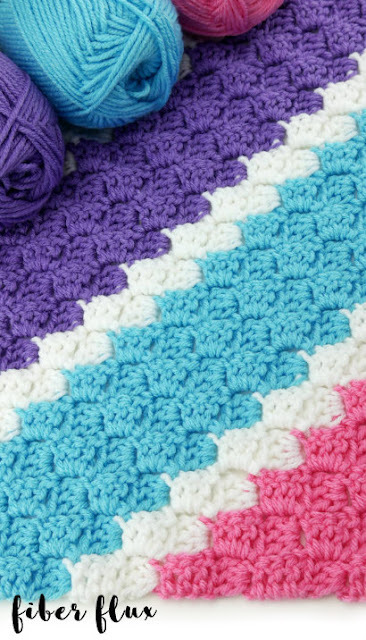 Today marks week one of the CAL and we'll be learning about the beautiful project we'll be making...the Springy Stripes C2C Blanket! 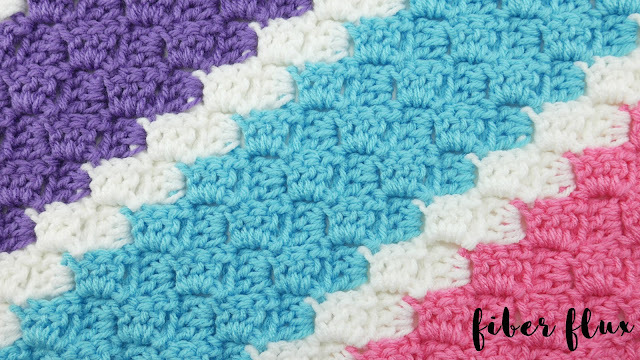 This is a fun to stitch up blanket that allows the maker to play around with color. Also wanted to mention a big thanks to those of you who have requested a c2c project! Also, a very special thanks to Red Heart for sponsoring this CAL and giveaway! 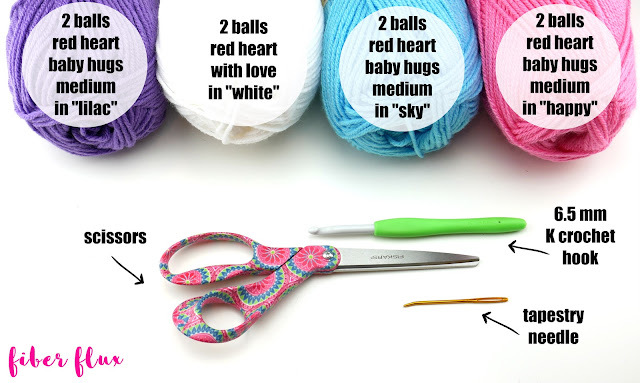 Keep reading to learn how you can enter for a chance to win 9 balls of With Love to make this project! For this CAL (crochet along) we're going to be making a beautiful striped c2c blanket! This has been a highly requested item in the Fiber Flux community, so I am beyond thrilled to get started on this project! The CAL will be divided over the next few weeks, concluding with a fun showcase of blankets in our maker gallery! Scroll down for the schedule with actual dates and what we'll be doing on each day/week. *This is a self-paced project, so definitely go at the speed you feel most comfortable. The instructional videos and posts will be up forever and you will always be able to go back and watch again and again! Size 4 medium weight yarn of your choice, approximately 2200-2500 yards (I'll be using 2 balls of Red Heart Baby Hugs Medium in "Lilac" 2 balls of Red Heart Baby Hugs Medium in "Sky" 2 balls of Red Heart Baby Hugs Medium in "Happy" and 2 balls of Red Heart With Love in "White" I also got an extra 1 ball of the "happy" colorway yarn to add pompoms in week 4 of the CAL. *Note: if you need to substitute yarn, just look for a yarn that is a 4/medium on the yarn weight scale and recommends the 6.5 mm K hook. The finished blanket (if you make the exact one I'll be making in the pattern and video is approximately 50 inches tall and 50 inches wide. 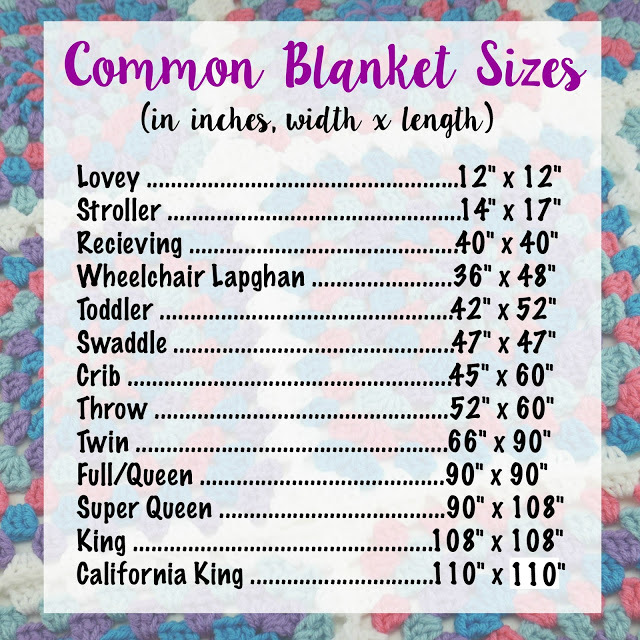 I making mine a large baby blanket/kid sized throw. 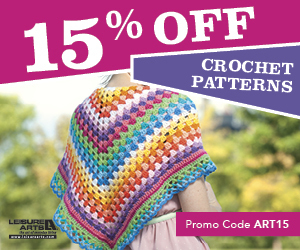 The blanket height and width can be adjusted by simply working more or less rows of the pattern. The first half of the blanket we'll increase the square and the second half we'll decrease, using roughly half of the yarn for the first half of the square. Thursday May 10 (that's today! ): Introduction to the CAL, GIVEAWAY, the project, size of finished shawl, yarn, and supplies needed. Friday May 11: Color palette inspiration on the blog! Wednesday May 16: CAL Giveaway ends. Friday June 1: The BIG CAL reveal! Thursday June 14: Today is Spring CAL Maker Gallery Day! Check it out to see all of the gorgeous blankets from the Fiber Flux community! Let's connect! You can connect at any of the social media outlets below, be sure to use the tag #fiberfluxcal for your photos. Also, we have a special group for us on Ravelry, the "Fiber Flux CAL Group" There is a welcome area, so please hop on and introduce yourself. You can get info, ask questions, help each other, see what everyone is doing, and show off your work too! Last thing...the YARN GIVEAWAY! 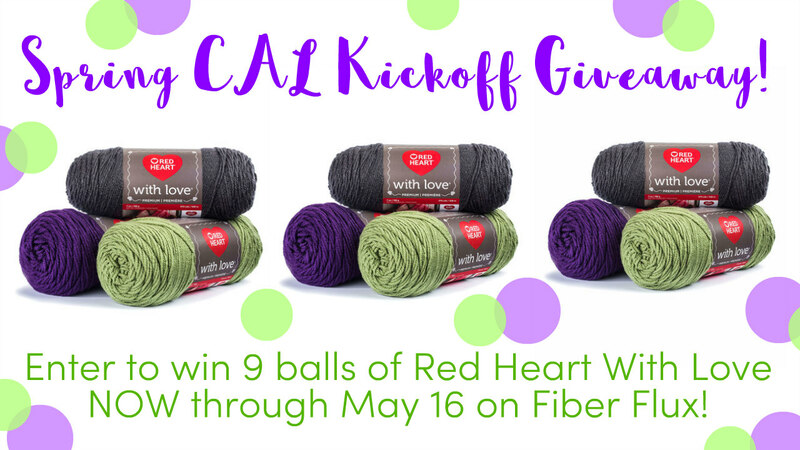 Enter for a chance to win 9 balls of With Love yarn from Red Heart! 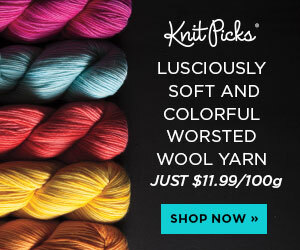 Now is you chance to win some yarn of your own! Enter to win using the Rafflecopter below (sometimes it takes a moment to load). Giveaway ends May 16th and is open worldwide. Now go, go, go, and enter!!! I can't wait to see all of your fabulous blankets...please share those pictures and above enjoy, take some time to relax with your hook, and have fun! That's all for today lovelies, see you next Thursday for part two!! This looks like such a fun CAL!! Hi I love the colors you chose for this project! I just learned how to do C2C so I am super excited to start this CAL!! YAY! I would stick with the spring colors. They are just so pretty!! !Thank you so much Jennifer and Red Heart Yarns! Nice spring CAL. Just started down big corner to corner samples this weekend! Nice CAL! I just started doing corner to corner samples this weekend. Fun stitch! I'm so sorry your link won't let me Post a comment on your blog, And it won't let me in to your the contest Either. I really wanted to enter and get on your blog to get to know your group better. But I can't, I'm very disappointed. Very grateful for you, Jennifer! This looks fun I may have to try it, this is something I have wanted to try and make. I always look forward your blog posts and tutorials. Thank you for teaching me how to crochet 2 years ago! I just found you you tube channel. I love it & have subscribed. This project looks like fun. I've never done a C2C before. Just what I need! Want to make one of these for my neighbor from her scrap yarn she gave me! I honestly don't know what colors I'd choose...I usually go for blues, tans and grays. I can't wait to see your video for this c2c technique. I'm thinking of just doing black and white for colors. Looks like a fun CAL!! Fabulous pattern made with one of my favorite yarns! Can't wait! I need to make some baby boy blankets, so I would probably choose colors like white, blue and green. I love the colors you chose. I'd probably go with them. I'd use very soft pastels - mint green, pink, pale lemon yellow, lilac and white. The colors for the giveaway are beautiful. Looking forward to this CAL. I would choose Dolphin, Pool, Sky and Bluie. This will be my first CAL I'm so excited to get started and see everyone blankets. Thank you for the giveaway chance! I like purples!! Any colors would work for me. I try to use what I have and then choose a project. Im thinking about a light green, light pink and an off white if i can find one. I'd choose the colors you have above for my girls or maybe a green and brown/tan theme if I made it bigger for our bed. I will stash dive and see if I can join! Would be my first c2c! How fun! Can't wait to make this one. It looks colorful and cheery. My kids will love it. Hi jennifer love your you tube channel and your blog. Im so excited to do they 2018 spring throw blanket. 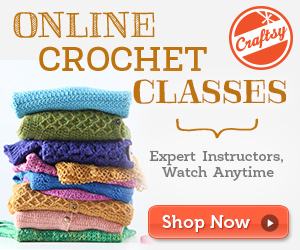 Thanks jennifer for all you teach us and make crochet fun!!!!! I love the colors you chose but would probably use a mint green, white, gray, maybe blue. I can't wait to learn how to make a blanket for my niece! Love this for a first c2c. I'd choose color anther pink E300-3938...love those rich colors. thanks for breaking down the C2C technique. I have struggled with it. I love the colors you have- blue, pink, purple and white! Where is the pattern link?